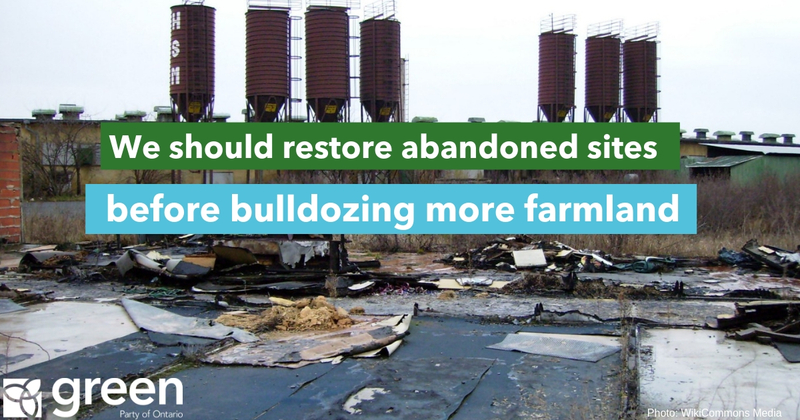 The Green Party of Ontario wants the province to restore funding for brownfield remediation in this Thursday’s budget to make abandoned land available for affordable housing. “I hear over and over again from municipalities that brownfields are a bottleneck to increasing affordable housing supply. The province needs to step in to cover the clean-up costs so these lands can help address the housing crisis rather than sitting abandoned,” said Schreiner. Ontario is home to 40% of the country’s brownfield sites, but existing tax incentives for property owners to make use of the lands have proven insufficient. The Ford government has mused about easing regulatory barriers, but has said nothing about reinstating provincial funding that was axed by the Liberals. “Redeveloping brownfield sites would allow us to address the housing crisis without paving over our food security and drinking water,” Schreiner said. Schreiner wants a firm funding commitment as a practical solution for increasing housing supply. “This is a win-win scenario. Just 20% of the land zoned for development within the GTA has actually been used. We need to maximize this land and redevelop brownfields before bulldozing more farmland,” said Schreiner. Greens are concerned about the Premier’s sprawl-driven growth plans in the Greater Golden Horseshoe. At the current rate, development will consume 1000 sq-km of prime farmland by 2031. And recent changes to lower density targets and remove environmental protections in the growth plan will grease the wheels for even more sprawl in the region. “Deep-pocketed developers are salivating over the Premier’s sprawl-first growth plan. But there is another way forward. We can build affordable housing without sacrificing more prime farmland and water source regions. And we can start with brownfield remediation,” said Schreiner.